The UD55 Cloning Small Option Module can store up to eight parameters-sets which contain all the read–write parameters for a Drive, and include those in Menus 16 & 20, when applicable. These parameter sets can be individually recalled for loading onto the same or another drive. The cloning of drives can only be performed when the operating mode (Open-loop, Closed-loop Vector, Servo or Regen) of the destination drive is the same as that of the source drive. The UD55 must be fitted in the small option module bay of the Unidrive. All connections to the drive are made by a multi-way connector. Connections from external equipment are made to a plug-in 16-way screw-terminal block on the option module. Some parameters have a profound effect on the operation of the Unidrive. They must not be altered without careful consideration of the impact on the controlled system. Measures must be taken to prevent unwanted changes due to error or tampering. 1. Disconnect the AC supply from the Drive. 2. Check that the exterior of the UD55 is not damaged, and that the multi-way connector is free from dirt and debris. Do not fit a damaged or dirty UD55 in a Unidrive. 3. Remove the terminal cover from the Drive. 4. If a small option module is already fitted in the Unidrive, grip the recesses at the ends of the module and pull the module out of the Drive. Keep the module for re-fitting. 5. Position the multi-way connector on the rear of the UD55 over the connector in the Drive (see figure below), and press on the thumb pad to push the UD55 into place. If the Drive trips and a trip code is displayed while this procedure is being followed, ensure that all the required parameters have been set up in the source Drive and that new parameter values have been saved. If a small option module was fitted in the Drive, its associated Menu 16 parameters will be copied to the UD55 in addition to the parameters in the other menus. 1. Insert the UD55 in the source Drive (refer to Chapter 3, Inserting theUD55 in a Drive). 2. Ensure terminal 30 of the Drive Signal connector is open-circuit so that the Drive does not become enabled when powered-up. 3. On the UD55 connector, connect terminal 40 directly to terminal 41 to enable the save function (see Figure 2). 4. Re-fit the terminal cover to the Drive. 5. Connect the AC supply to the Drive. 7. Set parameter .00 (in any menu) at 300X, where X is the required parameter-set number (1 to 8). 8. Press . The parameter values are now copied (saved) to the UD55. Saving takes approximately 5 seconds. When it has finished, parameter .00 returns to zero. 9. It is recommended that parameter 11.38 is set at the number of the parameter-set (value of X in step 7) and the value of parameter 11.40 UD55 full parameter check sum noted, as a means of identifying the parameter-set at a later date. 10. Disconnect the AC supply from the Drive. 11. Remove the terminal cover. 12. Disconnect the link between terminals 40 and 41 on the UD55 connector. 13. Remove the UD55 from the Drive. 14. If a small option module was previously fitted in the Drive, re-fit the module. 15. Replace the terminal cover. 16. The Drive can now be used. 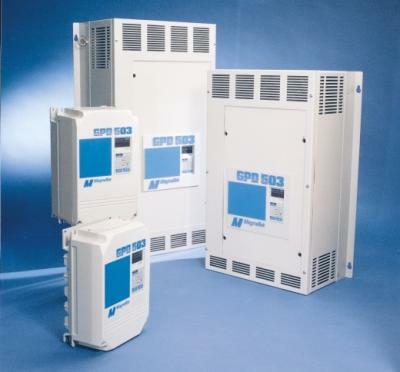 MRO Electric provides sales and support for Control Techniques Unidrives and their Option Modules. To request a quote or for more information, visit our UD55 Product Page or call 800-691-8511. Often people have difficulty installing a replacement drive that we send out, and normally it just takes the troubleshooting tips from the manual to get them up and running. However, the manual isn’t always the easiest to find or sort through, so below we’re posting the Siemens Micromaster 420 Troubleshooting section from the manual which should help anyone who is working to get the issues with their drive sorted out. MRO Electric supplies and repairs Micromaster 420 Drives. To request a quote for a repair or spare, please call 800-691-8511 or email sales@mroelectric.com. Here are some basic principles for troubleshooting a FANUC motor circuits with meter or megohm meter. This procedure will show you how to test for shorts in windings, cables, or opens. Before starting to test, make sure to turn all all the power sources to the machine and then disconnect the 3-phase motor lines from the drive end. Visually confirm that there are no problems with the cable and then begin testing. Using an Ohm meter: Disconnect all power and amplifiers from machine. Check all three wires at T1, T2, and T3 (all three phases) to the ground wire. The readings for this should be infinite, and if it is zero or reads any continuity then there is a problem with the motor or the cable. For this disconnect the cable and check each separately. Be sure to make sure leads on both ends are not touching anything, including the other leads. Most servo motor shorts can be ready with a regular quality meter going to at least 10 megaohms. Using a Megohm meter: Disconnect all power from machine. Check all three wires at T1, T2, and T3 (all three phases) to the ground wire. Reading should be between 600-2000 Megohms. Most shorts will be below 20 Megohms. Be careful not to touch the leads or the wires to anything when taking the reading because it can give a false reading. There should be about 1000 Ohms of resistance for each volt of incoming power, but this is not a standard rule. If it is 230meg to 600meg there may be deterioration in the cable. Using an Ohm meter: Disconnect all power from the machine. Put meter on ohms and test T1 to T2, T2 to T3, and T1 to T3. The range should be between 0.3 and 2.0 ohms, with most being at about 0.8 ohms. If it is zero there is a short between the two phases. If it is an open the reading will be infinite or well above 2,000 ohms. Cable and plug notes: Often times the connector on the cable to the motor will get coolant in it. You can dry it out an retest, if it is still bad the inserts will get burn marks in them and cause a slight short, so they need to be replaced. If it is a DC motor, check the brushes. There should be 3-4 round caps to remove around the motor. Under these there is a spring with a square block (brush). Check to see how much is left, they may need to be replaced. 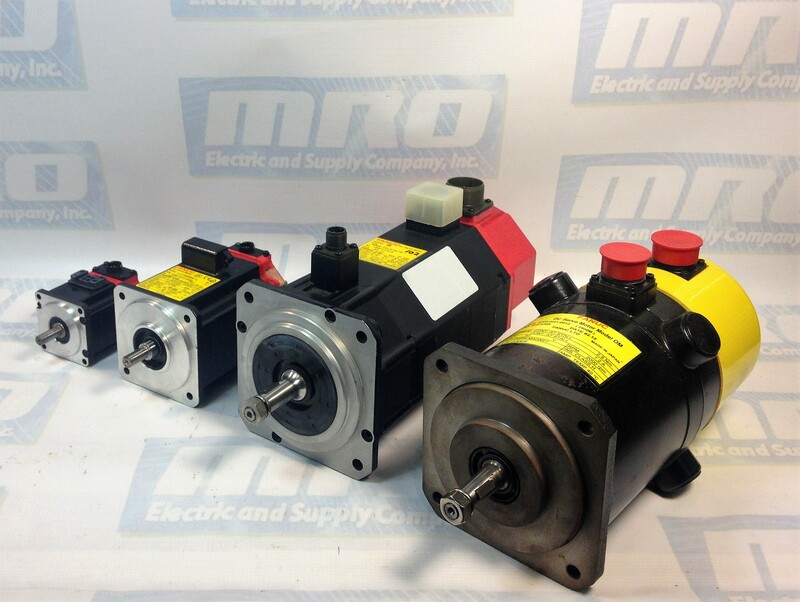 MRO Electric has a large stock of FANUC motors available. If you would like a replacement or spare, or if you have any questions, please call 800-691-8511 or email sales@mroelectric.com. 1. Be certain your input voltage source, motor, and drive name plates are all marked either 230V, 460V, or 575V. Other voltages can be used, but they require additional programming. 2. Mount drive on vertical surface with adequate space for air circulation. 3. Remove front cover, fit conduit to bottom plate, and connect power and ground wires. Caution: Be certain you connect power to terminals L1, L2, and L3 only, or serious damage will result. Connect motor to T1, T2, and T3 only. Important: Complete the Installation and Keypad Operation before attempting external control. Disconnect power, remove cover, and wait for “CHARGE” light to go out. Connect a switch to terminals 1 and 11 using two conductor shielded wire. This circuit is 24Vdc, very low current; use a quality rotary or toggle switch (all wire should be 14-18AWG). Connect the shield to terminal 12 on the drive end only. Install a single conductor “jumper wire” between drive terminals 5 and 11. Connect a manual speed potentiometer rated 2000-3000 ohms, 1 watt minimum, using three conductor shielded wire, with shield connected at terminal 12. Connect wires to the potentiometer. Trace wire closest to the top and connect to terminal 17. Trace center wire of potentiometer through and connect to terminal 16. The remaining wire will be connected to the trim pot in step 5. Connect a trim potentiometer rated 2000-3000 ohms, 1 watt minimum, as close to the drive terminals as possible. Viewing the potentiometer from the back, connect a single conductor wire from the left terminal to terminal 15 of the drive. Connect a short jumper wire between the center and left terminals. Connect remaining wire from manual speed pot as shown. MRO Electric and Supply Company carried new and remanufactured Yaskawa GPD 503 Drives. To place an order or for more information, call 800-691-8511 or email sales@mroelectric.com. MRO Electric and Supply Company would like to wish all our loyal customers a Merry Christmas and Happy New Year during this holiday season. 24 I/O : 14 inputs +10 outputs. Outputs : Relay outputs for models with ~ 100… 240 Volt power supply, transistor outputs with positive logic for models with 24 Volt power supply. Up to 3 peer TSX PLCs, communicating via common words, can be connected to the base PLC. In this case, only the base PLC can receieve an I/O extension. The function of each PLC is defined by the position of the coding selector switch. I/O addressing of peer PLCs is identical to that of the base TSX PLC. The extension link cable between the base PLC and PLC extensions is shielded, twisted pair and is no more than 200 meters long. Each PLC has 2 reserved (IW) and 2 reserved (QW) words for exchanging data between PLCs. These exchange words are updated automatically. For each PLC, the user program is only able to write to the 2 %QW output words and read the 2 %IW input words. MRO has many Modicon PLCs available. For more information, please email sales@mroelectric.com or call 1-800-691-8511.